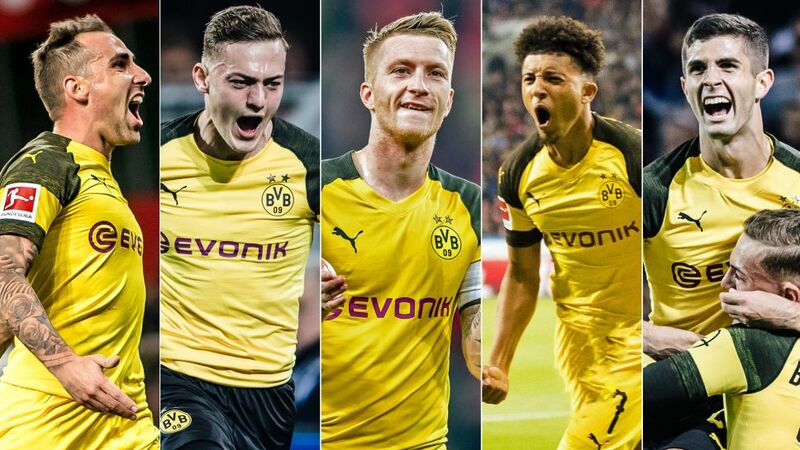 With Marco Reus, Jadon Sancho, Paco Alcacer, Jacob Bruun Larsen and Christian Pulisic on fire this season, Borussia Dortmund have hardly ever been in such good shape when it comes to their attack. Not since the prolific days of Robert Lewandowski and Mario Götze, who inspired them to back-to-back Bundesliga wins in 2011 and 2012, have the Westphalians boasted such a bounty of goalscoring options, and in a game where goals are the most precious commodity, their current numbers add up to a winning formula. With 23 scored in their opening seven Bundesliga games – at an average of over three per game – it is no surprise that BVB are currently leading the way. However, what makes that statistic all the more impressive is the way they have spread the burden, rather than relying on just one figure to fire the ball home. Goals and assists are coming in from all angles, and in particular from five flourishing outlets. Reus was around when the prolific Lewandowski and Pierre-Emerick Aubameyang were the ones putting the finishing touches to his creativity, but the Germany international is now doing both jobs, and he is already on track to set a new personal best. With six goals and four assists to his name, his best ever season of 2013/14 – when he scored 21 and created 20 – is looking threatened. A leader for club and country, Reus is managing to bring continuity and consistency into his game without any injury interruptions, and he is making up for all the time lost due to his regular absences with the energy infusion provided by Dortmund's hot young prospects. "If you have street footballers like Jadon and Jacob then it's really fun," he said after the recent win over Bayer Leverkusen. "We can be happy that we have these players and that things are going so well." Sancho became the first English player born in the new millennium to be called up to the senior England national team this week, but that will come as no coincidence considering the impact he has had on Dortmund's excellent start to the season. He has raised the bar after setting up four goals in 12 appearances of his maiden Bundesliga season, and he already has six to his name this term. Furthermore, he found the back of the net in the 7-0 win over Nuremberg and subsequently extended his contract through to 2022. That is a great coup for Dortmund for a player regarded highly across the continent. "Provided he doesn't become restricted, he could be our Neymar-type player – in terms of being unpredictable, playing on that left-hand side," said Dan Micciche, who coached Sancho at U15 and U16 level for England. What he saw back then is now being witnessed by Bundesliga fans each weekend: quick, unpredictable skills, dribbles, weaving runs past defenders and a sharp eye for goal.